The first China/England exchange took place in 2014-15, since then the programme has taken place annually with 2 specialists from each Hub nationwide been given the opportunity to visit Shanghai and see first-hand the high-quality teaching that takes place. On return the specialists have disseminated their findings through Hub events, newsletters and providing training. Lat year was the turn of Louise Foulkes and Debra Nemhara (both cohort 1 mastery specialists). The return leg of the exchange took place in Debra’s school, Tudor Court Primary. The return leg proved hugely successful with many colleagues from the South East of England visiting Tudor Court over the two-week period to engage in lessons and post-lesson discussions. This year, Ian Connor and Max Lawson (Cohort 2 specialists) were fortunate to visit and immerse themselves in Shanghai school-life. Both bringing back exciting ideas and new ways of looking at the teaching of maths. This year, the return leg will take place at London Fields Primary School, Hackney in the beginning of November. Each year, the exchange has become ever more popular – last year we had over 150 headteachers, teachers and other educational professionals visit Tudor Court. The lessons provide a rich learning opportunity for discussion amongst professionals. Last year the focus was subtraction in year 2 and fractions in year 6. The biggest talking points were the microscopic steps in teaching that were planned into each lesson which enabled the children to deepen their understanding and reflect on their learning. If you would like any further information regarding the Shanghai exchange, or you would like to visit London Fields Primary School in November, please contact Katie Bowles at the LNE Hub. In March 2014, Education Minister Elizabeth Truss and the BBC visited Elmhurst Primary School as part of the launch of the teacher exchange programme between England and Shanghai to share good practice. (Click on the link to see a short video). The Head Teacher Shahed Ahmed was involved in a ministerial rip to Shanghai in 2014. The following year, with the other Maths Hubs, Sukwinder Samra (Head of School) and Pinal Sheth (Maths Coordinator) also embarked upon this exciting journey and observed the conceptual learning that took place in every mathematics lesson. The deep-rooted belief in the Chinese culture that ‘Mathematics gets you everywhere’ and that ‘anyone can become an excellent mathematician’ forms the basis of the high achievement of the subject in Shanghai. Not forgetting their quick recall of their timestables known as ‘Jojo’ in Chinese; this has now become a focus at schools across our region for pupils to learn and recall related X and ÷ facts to at least the 12 X 12 timestables by the end of year 4. Most of the pupils if not all have learnt their Jojo timestables in Shanghai up to 9 before they even begin school at the age of 7! In November 2014, Elmhurst Primary was privileged to host the two maths teaching experts Ms Yu Chenli and Ms Wang Xin who taught in a year 2 and a year 4 maths class daily, focussing on multiplication and fractions respectively. The teachers over here were inspired by their gradual step-by-step teaching approach whereby the use of varied visual representations, high level questioning, language structures and use of mathematical vocabulary (addend, minuend, subtrahend) provided pupils with tools to explain with precision. We had a large number of Head teachers, maths coordinators and teachers from a number of boroughs observe the Shanghai approaches in maths lessons here and everyone thought the level of depth reached within a lesson was fantastic. During this time our Shanghai teachers and Mr Walker in year 5 rose to fame by featuring on the BBC One Show and Breakfast News. (Click on the link to see The One Show video). Well done! Zuò dé hǎo! One of the key differences is that teachers in China are trained Mathematics subject specialists and teach the one subject including Primary. In Shanghai, teachers teach between one to three 35 minute long lessons daily and the rest of the time is for teachers to collaboratively plan and engage in teaching research group discussions/lesson study work. They engage in regular interventions in small groups to address misconceptions and provide pupils with extra practise to refine and consolidate their learning on the same day. Mathematics is mandatory for all pupils up to the age of 18 and the paramount importance given to mathematics as a vital toolkit for life shows their soaring attitude for the subject. Enough time is spent every lesson to go deep into the concepts. Stratford School Academy Maths teachers, Ms. Mahroof and Mr.Kibria visited Shanghai for a fortnight along with 68 other teachers from across the UK to visit Chinese teachers as part of the Maths Hub National Collaborative Project. 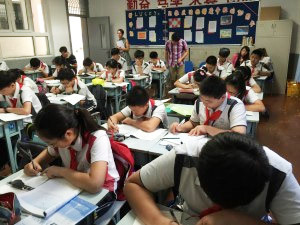 The aim of the project was to develop a deep understanding of how maths is taught for mastery in the equivalent of KS3 classes in Shaghai; to develop the knowledge, skills and attitudes to attune and align with those of their Shanghai counterparts and finally, to implement successfully some of the Shanghai structural and pedagogical approaches in our KS3 classes back at Stratford School Academy. Teaching for mastery ensures that students have a deep conceptual understanding, rather than just procedural fluency; i.e students understand WHY as well as knowing what to do in a situation. “I was fortunate enough to be part of this nationwide project and was really impressed by some of the aspects of the Shanghai approach of teaching Mathematics concepts. One of the main aspects was how well they train their students by encouraging them to do the higher order thinking skills by emphasising on only one concept in a lesson and exploring different types and levels of questions, clarifying misconceptions before they are met. These are achieved by working alongside the school’s Maths teachers in a carefully planned and supervised programme called Teacher Research Programme. We are hoping to research elements of the Shanghai approach to teaching Maths that may be implemented in English school settings. ” Ms Mahroof- Head of Maths. “It was a unique once-in-a-lifetime opportunity to observe and co-plan lessons, provide feedback and discuss and share best practice of mathematical teaching and learning, with Shanghai teachers who are part of the best educational system in the world. (Shanghai are ranked 1st in the world for Maths, Science and Reading, Pisa 2012). It’s been a truly eye-opening experience.” Mr Kibria. Stratford School Academy’s Maths Department then hosted two maths teachers from Shanghai, for the return exchange part of the project. Over 90 teachers paid a visit to the school to watch lessons and take part in pre and post lesson discussions. Click on the link for a news item from the Newham Recorder. The Maths Department has been collaboratively planning with its teachers in order to gauge the sequential thinking behind their lesson planning. This meant that as a school we began to consider how we would adjust our lesson design template in order to give weight to some of the key teaching approaches. The “away” and “home” legs of the exchange have resulted in greater collaboration/joined up working with local schools. When Musy was explaining the expanding brackets, she introduced the topic with finding the area of a garden. This was a good introduction as the class already knew how to find area of rectangles with numeral sides. The lengths were then changed to algebraic expressions and students were immediately able to make the link. The abstract questions all have had visual representations beside them which embedded the conceptual understanding and further linked the two together. A lot of eureka and “ohh” moments took place! Another example, was when Musy introduced Algebra. She started off with a box of random items and asked students to estimate/guess the number of items in the box. No student could give the exact answer so she called it n, and it was a powerful way of introducing generalisation. Pupils can see the purpose behind using a letter to represent an unknown. Pupils are becoming more confident with dealing with certain questions as they now have a variety of methods that they can draw upon and can really understand why a certain concept holds.